My guide book said that Angra do Heroismo was one of the most beautiful cities in the Azores and a must-see for any visitor to the archipelago which lies in the Atlantic Ocean about 900 kilometres west from the Portuguese coast. Having spent a couple of days exploring this delightful town this summer, I was so impressed that I am already making plans to return. 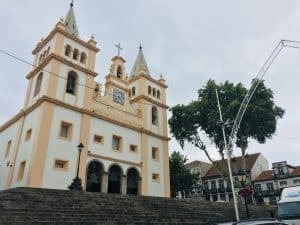 Angra is the capital of the second largest of the Azorean islands – Terceira – so named because it was the third of the nine islands to be discovered. It’s a relatively small, easy-to-walk around coastal town, oozing with charm, and with the largest Spanish fortress outside Spain. There is even a long extinct volcano on its fringes. 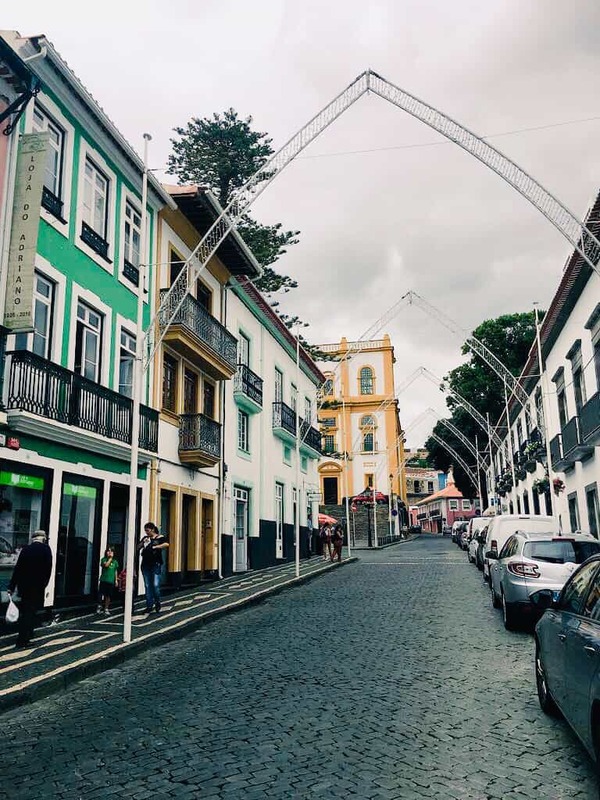 Not surprisingly, given its attractive colonial Portuguese buildings, Angra is now a UNESCO World Heritage Site, having been given this status after the rebuilding that took place after an earthquake struck in 1980, destroying around two-thirds of the buildings on the island. But visitors should not spend all their time in Angra. 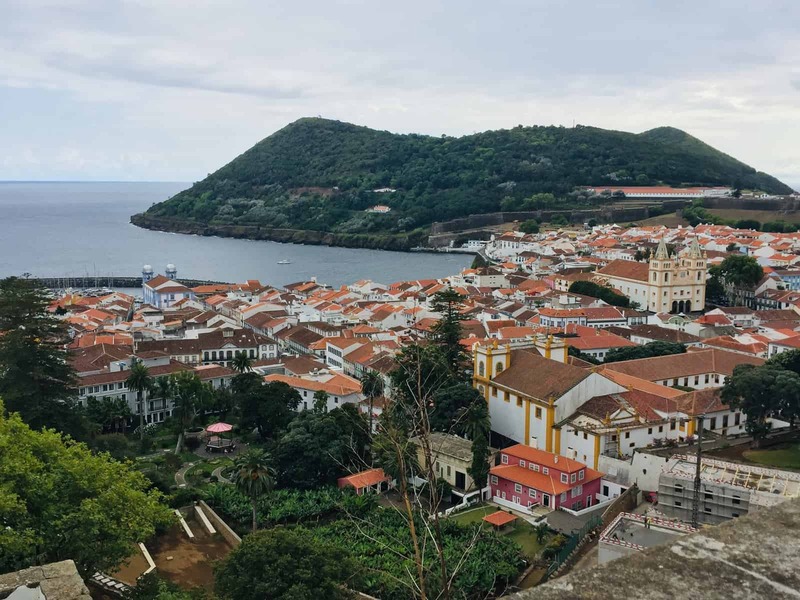 As is the case throughout the Azores, it’s all about the incredible landscape and stunning scenery. From Angra, it’s really easy to explore the rest of this beautiful island and visit its natural treasures. 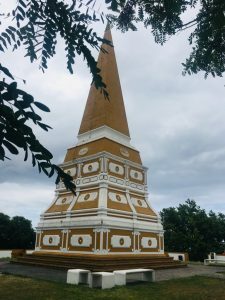 We split our time equally with a day in the capital and another day driving around the island. 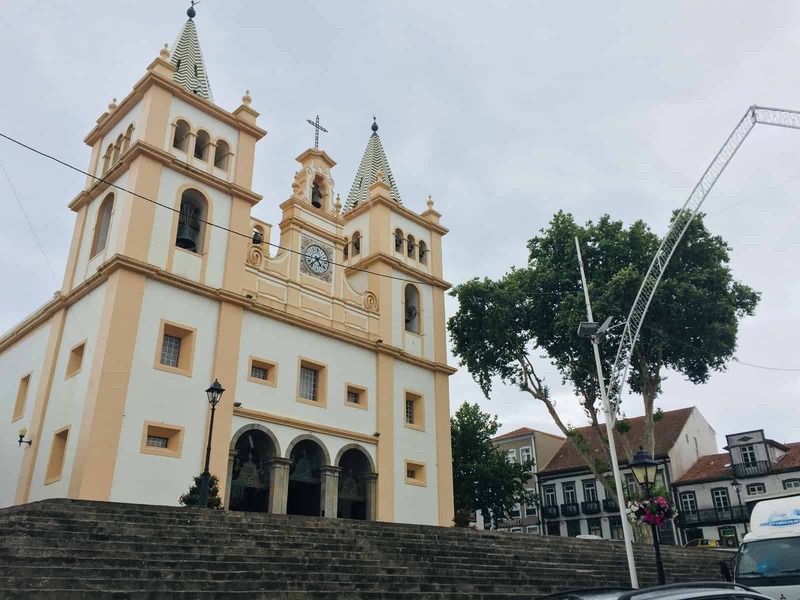 I’d suggest you start in Praca Velha, the city’s main central square that houses the Town Hall and from where the main streets of Angra radiate out from. Apart from the slight disappointment that the square has traffic passing on three sides, this is an ideal spot to sit and watch the world go by, with its small outdoor café serving some local delights. 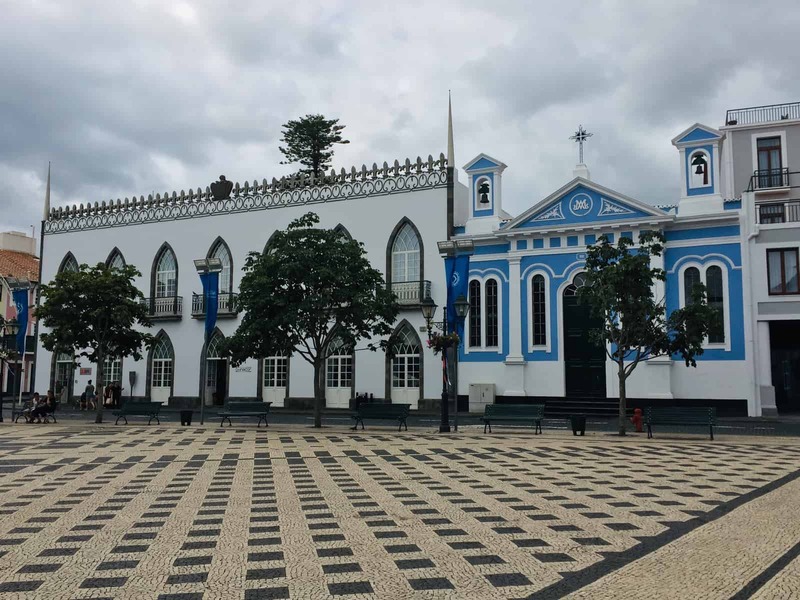 A few minutes away from Praca Velha is the Jardim Duque da Terceira. When we visited, the garden was bursting with the colour of blooming flowers and offered a shady spot from the summer sun. But it’s also the start of a short climb up to the Outeiro da Memoria, erected in 1846 in honour of King Pedro IV. If you can manage the ascent, you really should try, as the sweeping views from the top take in the entire town. From the garden, follow the path upwards to the monument, which is hard to miss. The mustard-coloured obelisk stands atop a hill dominating an open square. The obelisk itself was a bit of a surprise – to me, its style and colour lends it a slightly Asian feel (possibly a reflection of the city’s importance as a port for ships from Asia and South America passing by the Azores on their route to and from Portugal). The views from this point back over the town and out to the sea were not, however, a surprise, having already seen some of the scenery that the Azores is famous for. There are small stone seats carved into the wall, so if you have time, spend a few moments sitting and looking at your surroundings – and getting your breath back! 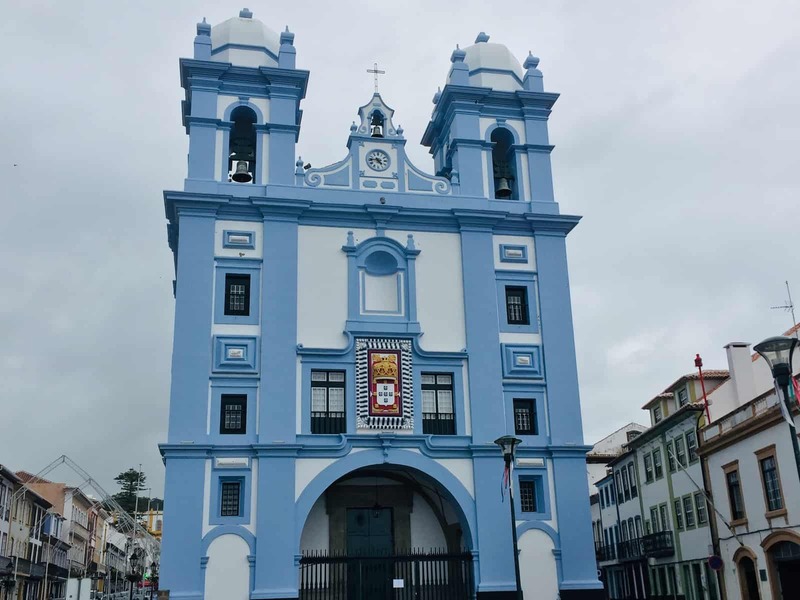 You’ll then pass the Igreja da Misericordia, an imposing pastel blue coloured building where the first Azorean hospital once stood. Cross the road, past the life-sized bronze statute of Vasco de Gama and walk down the steps to the side of the fountain. 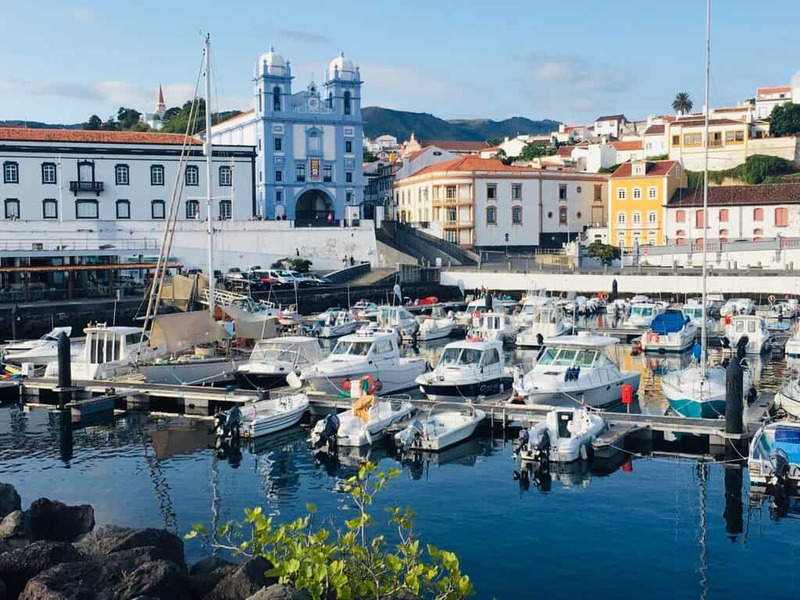 Wander the small harbour and don’t forget to walk along the sea wall; when you do make sure to look back at the Igreja and you’ll see what a wonderful vista it is – this was one of my favourite spots. To the side of the harbour, there is a small sandy beach for those hot summer days; climb the steps up to the streets above and head in the direction of the fort. 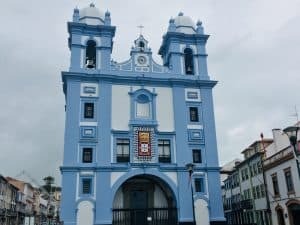 You will pass more brightly coloured houses and eventually come to the Convento de Sao Goncalo, another magnificent building and the largest convent in the Azores. This is worth a quick stop to peek inside before walking the short distance back into town. A word of advice: there’s a cake shop opposite where you can sample some of the unique local cakes (should you need some sustenance!). 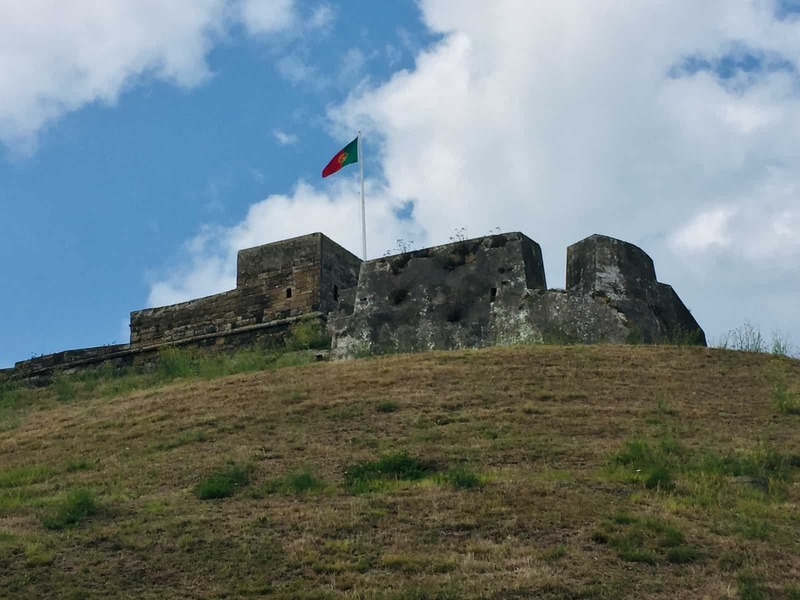 You can also walk to the outskirts of the town to take a look at the 16th century castle and fortress – Castelo de Sao Joao Baptista (the aforementioned largest outside Spain) – and to walk around its ramparts and walls, which stretch 5km. This sits at the tip of Monte Brasil, the extinct volcano that is now a national park, and so you may want to carry on and out of town. We didn’t make it, but there are apparently great views to be had here, and a walking and hiking trail. The town has a number of cafes, bars and restaurants to choose from that serve a range of food, including local dishes as well as more international offerings. My favourite place for an evening tipple was, however, the outside bar in Praca Velha. 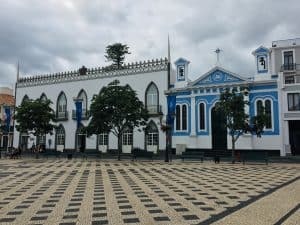 This is a great place to sample some of the traditional Azorean liqueurs (the passionfruit and blackberry ones are definitely worth tasting) whilst watching the sun go down. I loved it! After familiarising yourself with the town, you must get out and see what the island as a whole has to offer. Terceira is volcanic, so you need to see some of the caves and craters. You could easily spend a day exploring these alone. We booked an organised tour for this – a small group of four of us – and started the trip with a stop at the top of a ridge in the Serra do Cume mountain range. Here you can see across a huge wide open crater in the middle of the island. As the starter for the day, this was pretty amazing. 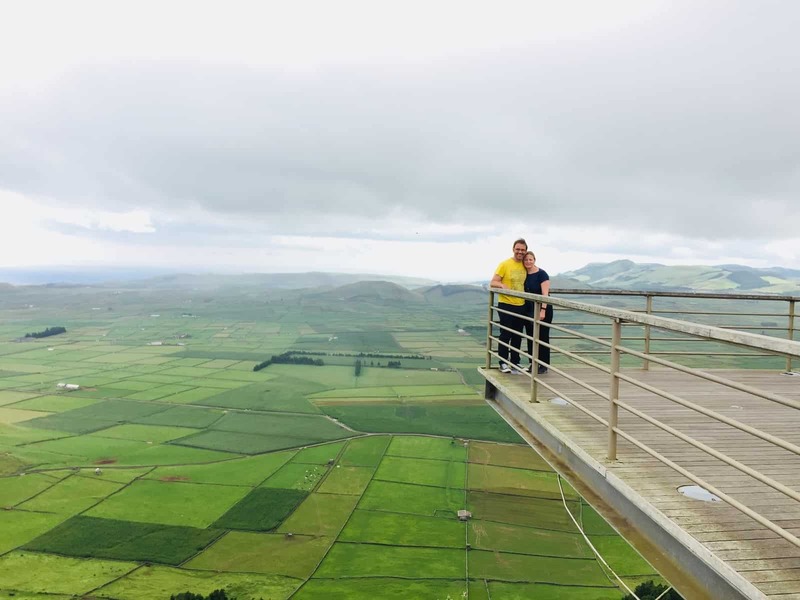 There is a viewing platform which offers a quite breathtaking view over the wide and flat patchwork of green fields below, all divided by a grid of dry stone walls; it’s really something to take in. We were told by our guide that no-one really lives or works in this area, (although we could spot a few cows grazing), which made me wonder why there had been such an effort put into dividing the area into fields; but apparently, this had merely been a convenient way of disposing of the stones produced as a result of the volcanic eruptions in the area. 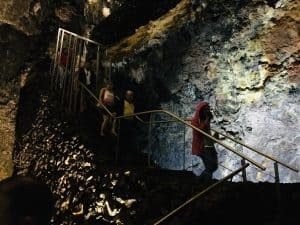 On that note, we then headed off to visit the Algar do Carvao, a volcano that you can climb down inside to look around. 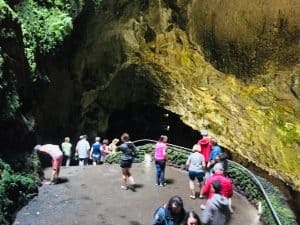 This was a fascinating opportunity to see the various features that the volcanic activity on the island two thousand years ago left behind: in the darkness you can make out stalactites and stalagmites, deep caverns and the leftover lumps of basalt that were dumped as the lava flowed through the caves. There’s also the “Cathedral”, a large cavernous open area in the rock with a doomed roof above; the cavern’s shape creates some wonderful acoustics, so much so that concerts are often held here. 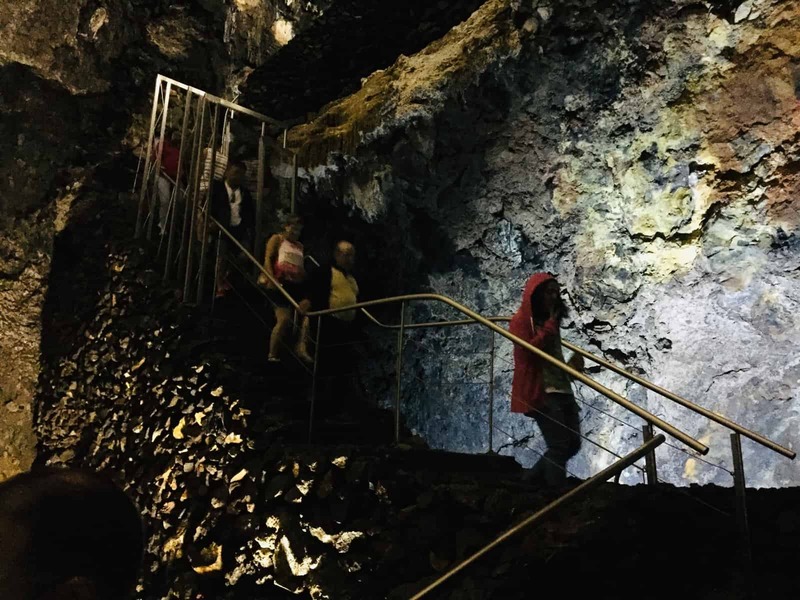 After stopping off to look at hot sulphur steam rising up through rocks in the countryside, we headed to the Gruta do Natal (which translates as “Christmas Cave”, named after the date the public could first visit). 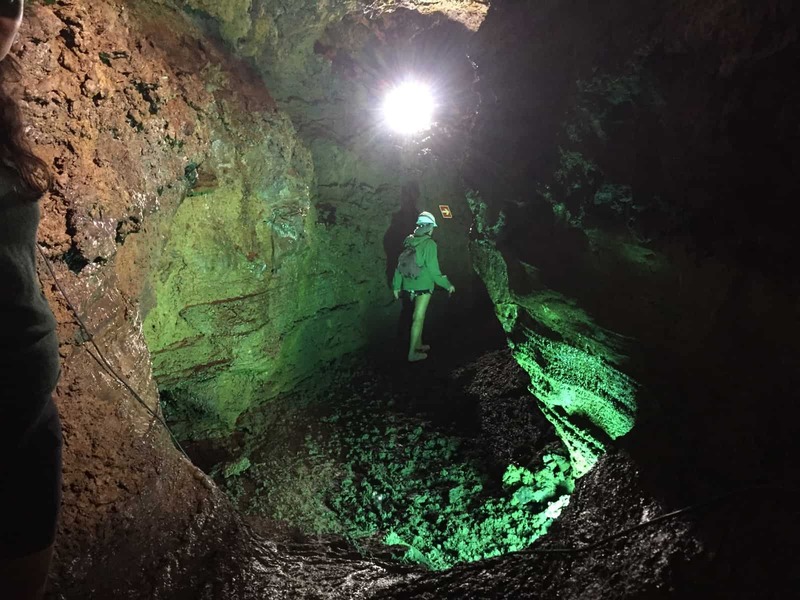 This is a 700m lava tube underground that you can walk along – or rather at times crawl along (this explains why you need to wear a hard hat – as you move further and further through the tube, the ceiling gets lower and lower; at one point, we were literally crawling along the cave floor, stooping to get through the smallest of openings). This is another opportunity to see some of the rock formations left over after the volcanic activity – but here, the path of the lava is easier to see, with clear striations on the rockside and floor showing the “drag” of the stream of lava, and giving a real sense of how the lava powerfully snaked its way through the terrain. We ended the trip with a drive up small windy country roads to the highest point on the island: Serra de Santa Barbara. At over 1,000 metres, on a clear day, (which we were fortunate enough to have), you can see neighbouring Sao Jorge and Pico islands. This was a great way to end our trip to Terceira island. 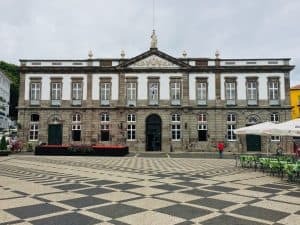 Having already seen Sao Miguel (see my three day itinerary here) in an earlier part of this trip, I now can’t wait to visit the other seven! We stayed at The Hotel do Caracol – http://www.hoteldocaracol.com– just outside of Angra and overlooking Monte Brasil. This is a 20-30 minute walk from the town, but during the day you can catch a local bus (less than a euro each) or in the evening a taxi (around €5). 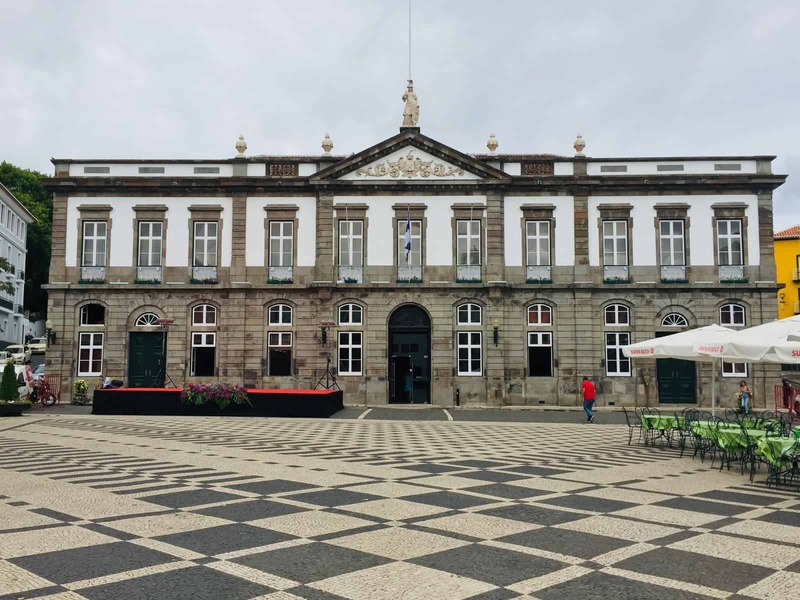 We booked our trip around the island with TuriAzores – this was £45 per person for a trip for around 5 hours, and included all entrances fees, as well as a small cheese tasting at the end of the day.